Port Tampa Bay is Florida’s largest maritime port web portal and mapping solution, which communicates with remote de- and the 16th largest in the U.S. and it recently imple- vices over the Iridium Satellite Network. It provides a secure interface for mented PlateSmart’s ARES enterprise license plate tracking, managing and communicating with globally dispersed assets in recognition-based video analytics system to enhance real-time. The new Alerting system empowers ? eet managers by deliver- security. Overseen by the Tampa Port Authority, the ing customized, pertinent asset information directly to smartphones and port handles both commercial and passenger traf? c tablets. Stena Transit and Stena Transporter, two Ro-Ro ferries owned and oper- vide them with background checks on entering ve- ated by Stena Line, are to be retro? tted with Wärtsilä in-line closed-loop hicles when necessary. PlateSmart said the Tampa Port Authority was not enable the ferries to comply with the regulations covering SOx emissions able to ful? ll any of these needs reliably prior to in- while running on HFO, as the operating routes of these two ferries fall stalling the camera systems. PlateSmart’s ARES En- within the North Sea’s SECA. AVCS service, with a further roll out planned throughout Q1 and Q2 2015. 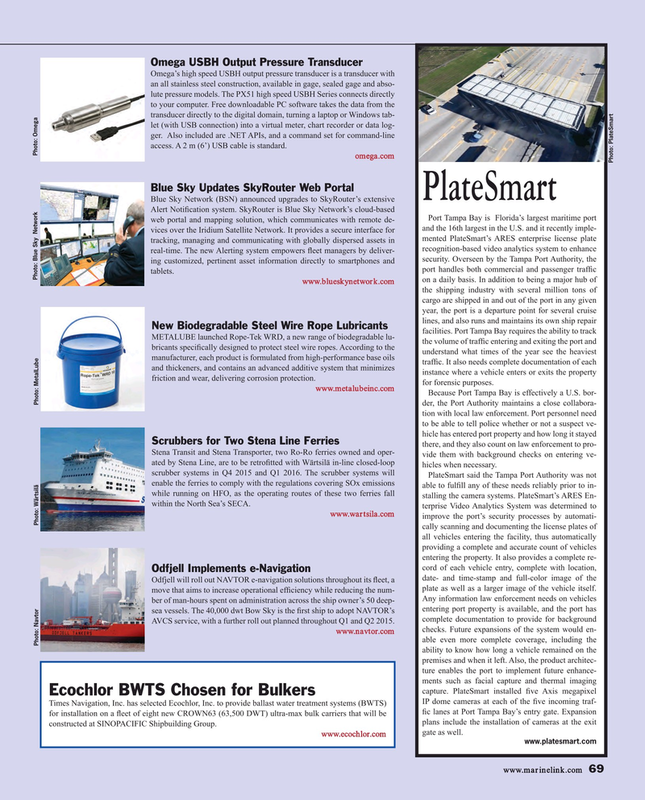 Times Navigation, Inc. has selected Ecochlor, Inc. to provide ballast water treatment systems (BWTS) ? c lanes at Port Tampa Bay’s entry gate. Expansion for installation on a ? eet of eight new CROWN63 (63,500 DWT) ultra-max bulk carriers that will be plans include the installation of cameras at the exit constructed at SINOPACIFIC Shipbuilding Group.